Your favorite and most comfortable boots are falling apart or starting to show signs of wear and tear? Don’t head for the garbage bin just yet! There are ways to salvage your boots. 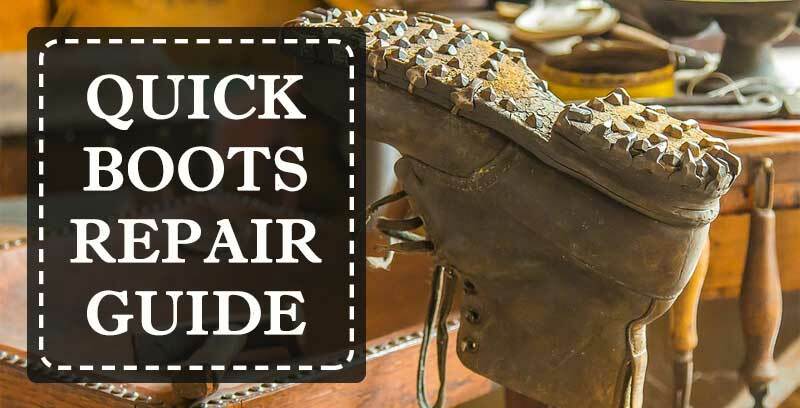 The obvious method is to take them to a reputable cobbler, but make sure that the repair work doesn’t cost as much as the boots themselves! Ensure that the damaged boot is perfectly clean completely dry before proceeding with the repair. Remove any grease or impregnator from your shoe before you go ahead, because it can hinder the performance of the adhesive you will be using to fix the damage. Apply duct tape or another type of tape from the inside of the boot at the place where the hole is or where it is torn. Seal the torn material or the hole with the leather or other appropriate adhesive. Spread the glue on the damaged area carefully. Be careful because the instrument you are using to spread it can get stuck to the shoe. For best results, use an ice cube to spread the glue around. Let the glue dry completely, and once it is dry remove the duct tape from inside. Use a small paintbrush and paint thinner or carefully cut off any excess glue after it is dry. Meticulously clean both the sole and the upper surfaces which will be re-attached together. Let them dry completely before proceeding with the repair work. If the sole is seriously coming off, it is best if you remove it altogether, because it will be easier to stick it back on that way. Apply the shoe adhesive to both the sole and the surface of the upper where it will be attached. Line the sole and the shoe properly, so that they make perfect contact with one another. Wipe off any excess glue which is leaking out between both shoe parts. Set a heavy object on top of the boot to allow for the sole to get stuck properly back to the shoe and let it sit for 24 hours. After it is completely dry, you can gently cut off or take off any excess glue with the help of paint thinner. Use a soft cloth and saddle soap to clean the leather. Apply the saddle soap to the cracked leather with as little water as possible. Make sure the boots are dry before repairing the cracked leather. Let the boots dry off naturally without direct sunlight or a direct heat source. Stuff the boots with newspapers to help keep their form while you are treating the cracks. Apply mink oil on the cracks and crevices, so that it can penetrate deep into the material. Get leather shoe cream which matches the color of your boots and apply it generously on the uppers. Polish and buff both boots, so that they are equally buffed.